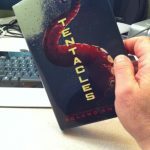 I spent today…well actually, the last few days…re-reading Tentacles in preparation for the third, as yet un-named, third installment. I hesitate to write this here because it might mislead you into thinking that the third Cryptid Hunter book will be out soon. It won’t be. It will be a long time before you get a chance to read it. First I have to finish the rough draft. Then I have to revise it over and over again. Then I send it into the publisher. Then they revise it over and over again. Then I revise it over and over again. Then about a year, or year and a half later, the book comes out. This is how all books are written and published. I’ve gotten a lot of emails asking when the third CH book is coming out. In fact, I got at least a dozen emails about this the DAY AFTER it came out. I know this means you like the book, and the characters, for which I’m very grateful. But keep in mind that it takes a lot longer to write a book, than it does to read a book. I usually don’t read my books again. The only exception are sequels. I read (actually kind of skim) the previous book looking for details that I might have forgotten during the various drafts before it was published. The skimming takes a lot time, because as I’m reading I’m thinking about the current story, madly scratching down notes and ideas that I might use as I write the draft. I’m not posting this to tease you. I’m just letting you know what I’m working on. I’m also working on the 3rd I,Q novel (the second I,Q should be out by the end of the week), and two other books. what will be the name of the new book? I’m calling it Chupacabra right now, but that is subject to change when I finish the book. I’ll let you know when it come out here and on my Face Book fan page. I know it takes time to right a book but, could you for me just right it a teeny bit faster this time. I’m dying to read it! i know this post was published last year but i just wanted to say that i have the Cryptid Hunters book and Tentacles sitting in my own personal library for over 7 months now (so it seems) and i finally picked up CH #1 and finished in about a day or 2. i could not put the thing down! i stayed up until midnight and FINALLY finished CH #1 then quickly picked up Tentacles and started reading that. i am in the middle of the book now and just put it down to write this on here (i will prob. start reading again once i am done typing this) but the CH series is prob. the best i have EVER read. and that is big for me to say because i am 11 years old and i am the biggest reader in the world (so i think.) i cant wait for CH#3 to be published and to land in mt hands soon after! I <3 your books AND you roland smith!!!! This was published last year. Any updates on when this will be hitting the shelves? I’ve don TONS of research and can’t find out… Amazing (!!!) books! I read Tentacles first about a year ago, without realizing it was a sequel… then my library finally stocked Cryptid Hunters and I read it in 1 DAY! So great! I hope it will come out soon, I have read all of Roland’s books. Including Saquatch and the cryptic huters series. Can’t wait!!! Just finished reading tenticals for the second time. I am a huge fan and was wondering when it might be out hurry please!! Ahhhhhhhh. I just finished reading princess diaries and I can’t way to read a real old book like this. Hey i am not that much of a reader but ur books just had the intensity to make me read a lot. I hope u finish ur 3rd bk bcuz i remember a few yrs ago when i was reading all day on the couch (tenticles and the 1st 1) btw im 13 now and id love 2 read more of ur books. How old are you Roland, my Grandpa said his teacher read him Thunder Cave as a kid. I love your books, cant wait for the third CH book to come out, and are you thinking about writing a 4th IQ book?? Sorry I’m not a very patient sort I started to read CH back when I was in middle school. I never knew the secound book had come till I was going into my senior year of high school. Here’s hoping your third book comes out soon. When I first read Cryptid Hunters I was 9. I’m 15 know and your 1st book still remains an old favorite. I was always interested in the study of archeology and discovering old mysteries. The only regret I have with the 2nd book is reading it so quickly. Now I must wait impatiently for the 3rd installment. Looking forward to it. Hi! Ijust got done reading TENTACLES! so exacly is this 3 gonna come out? I just love your books. I read CRYPTID HUNTERS, ERUPTION,TENTACLES!!!!!! !PLEASE WRITE FAST!!!!!!!!!!!!!!!! Hurry up!!!!!!! I so cannot wait for your next book!!!!! I can’t wait til the book after Tentacles. I feel really bad for Grace. when do you think it will be published? its been a while now, an i have been wondering. It’s been about two years now….any news??? Can’t wait for chupacabra to come out! I can’t wait 4 the 3rd book. I’ve read every book 30 times. Cannot wait plz HURRY!!! Hi am a big fan of yours Roland Smith I hope the third book of the cryptic hunters comes out by October 2013. I hope the Mokele Mbembe ( one and two ) live though the third book. I cant wait i realy love the other 2 im gonna die if it doesnt come out soon. I just read tentacles. It needs a third book! Why can’t you write one right after you finish one? That is if you REALLY need one. Which you do! It needs a third book. Hurry it up a bit! Oh and, is this website up to date? Cause I have no idea if the book has already come out or not. Take your time Roland! Great art isn’t made in one day, I am sure they will be awesome but we can wait! you finish the book sooner then you think. The name Cupacabra is amazing. in mexico my mom told us lots of stories about that “creature”. OMG ZRoland hurry up!!! I want this book sooo bad. I was devastated to read the end of Tentacles. It was really sad, also kind of ironic about the dragonspy in the pocket! sorry about that Z up there Roland!! I own both of the CH books, and I’ve had them so long I lost Tentacles. Maybe my brother stole it. If Roland gets the book out in a few weeks instead of a few years, I’ll give him my entire bank account. I really cant wait for the third Crytid Hunters book. I have read CH and Tentacles both at least 4 times just waiting for the next book. I love your writing!!! Paul, my grandson has been sharing with me the books you wrote, Mr. Smith, and with him I have become an avid fan. Paul was so excited when you visited his school, a few years back. Thanks to your stories many children are excited to read, and I surely am not alone thanking you for all your hard work! The third book came out yesterday, which im in seventh grade now and have been waiting for that day since third grade when i read the first two books. I have delt with mean teachers and stayed up late with extra credit so I could get this book. I hope you make a fourth.